Heat pumps extract heat energy from an external source (air, water, ground or bedrock) and convert this free, natural, renewable energy into heating for your home. The principles involved are the same as in a domestic fridge: fridges absorb heat from inside the fridge and expel it into your kitchen; heat pumps absorb heat from the source and bring it into your home. 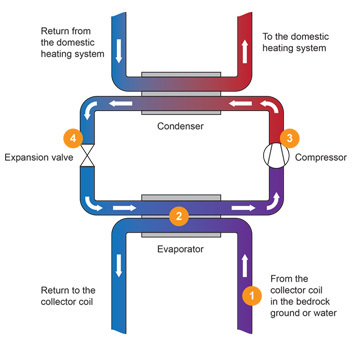 The diagram and explanation shows how a ground source heat pump works in greater detail. Air source heat pumps work in an identical way except that the source of heat energy is the air rather than the ground or bedrock. Brine 1 circulates in a collector coil and absorbs the heat energy from the source. At the Evaporator (heat exchanger) the tepid brine in the collector coil meets the ice-cold refrigerant 2 in the heat pump, which is then heated a few degrees 0C and evaporates. A compressor compresses the refrigerant and the heat that is then generated is transferred via a Condenser to the dwellings heating system. The refrigerant continues to circulate and an expansion valve lowers the pressure that in turn drops the refrigerants temperature and the whole cycle starts again. Find out more about air source heat pumps and ground source heat pumps and how they work.